Indeed, a hand (actual size) moves around the table in small circles. It will stop randomly and its finger will point at one of the players. He or she has to choose whether to take a truth or dare question. If he or she does not complete the mission successfully, he or she must face an extra forfeit challenge, written at the bottom of the card. A game full of excitement where children will love to be pointed at! as of 7 years Content 1 electronic articulated hand*, 100 cards, 1 manual. * works on 3 AA batteries (not included). Creepy Hand UK 20" Based on the famous game 'Truth or Dare', this game will surprise everyone! Indeed, a hand (actual size) moves around the table in small circles. It will stop randomly and its finger will point at one of the players. He or she has to choose whether to take a truth or dare question. If he or she does not complete the mission successfully, he or she must face an extra forfeit challenge, written at the bottom of the card. 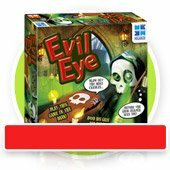 A game full of excitement where children will love to be pointed at!